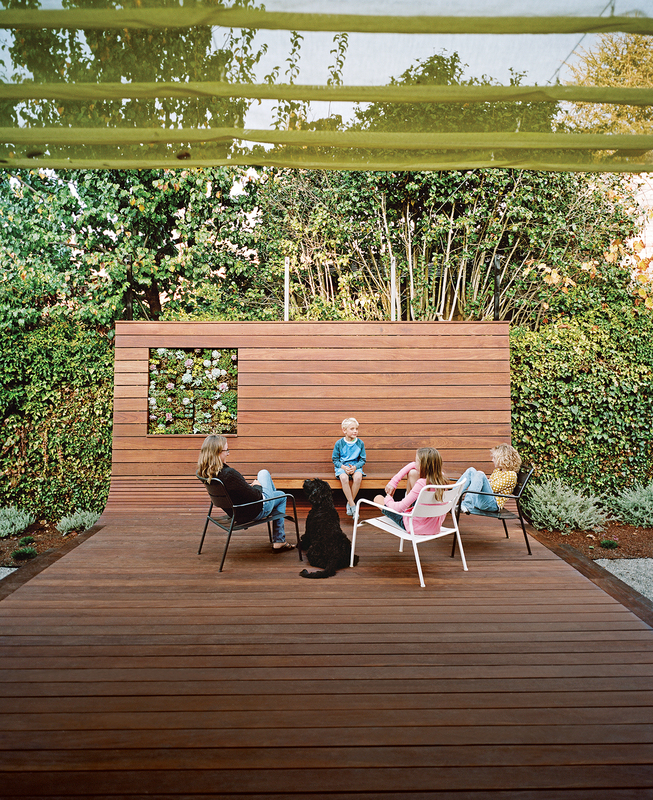 An ipe deck slopes sharply skyward behind Amy Persin’s house in Menlo Park, California, creating a secluded backyard getaway that feels like an outdoor extension of her living room. A single step on either side leads to patches of gravel, which her children have claimed as areas for unstructured play. The vertical planter in the deck contains ten varieties of succulents. Persin and her children, Lu, Mae, and Calvin, pose on their front stoop, built with ipe left over after the completion of the back deck. “It looks lush—almost like a fur blanket,” Persin says. Cox initially conceived the deck as a conventional surface for relaxing and entertaining. With the bench, however, he seized an opportunity to create something both functional and visually arresting. “You go down these paths and, as the design mutates, other ideas attach themselves and make it stronger and more interesting,” he says. Cox says he and Persin “went on an ipe run” after committing to the material for the deck, using it to build the slatted fence around the backyard. Rainbow Warrior New Zealand flax, a perennial, complements the material, while off-the-shelf pavers helped keep costs down. Amy Persin, a single mother of three rambunctious children, survived the renovation of her 1950 ranch-style house in Menlo Park, California, before she turned her attention to her yard. A crumbling concrete patio, its red paint faded to a garish pink, was the focal point of a rather uninviting backyard, while in the front, the Kentucky bluegrass demanded time and attention that Persin simply couldn’t spare. She turned to landscape architect Brennan Cox for help. Cox, the principal at San Francisco’s Groundworks Office, drafted two plans, the more adventurous of which included an upturned deck with a bench and an embedded succulent garden. To his surprise, she went for it, and construction finished in May 2012. Persin got the idea for the canopy—a brail curtain that slides over the deck on four cables—from her children’s school. “It’s like a terrarium; it’s this little oasis of peacefulness,” she says. “I like being able to look through the house all the way to the street. It’s private, but you’re still connected. It just flows."